There has been a lot of buzz around for Apple watch and now, it is nearly here. Apple’s latest release- Apple watch SDK for future iWatch gives the people, a glimpse of how the experience of Apple watch would be. The use of iWatch will greatly rely on iPhone and always require the user to have iPhone with them. Even, one could say, for Apple Watch app- iPhone works as backbone and Apple watch is an extendable interface. Watchkit, an Apple watch SDK has two components- Watch app on Apple watch and the Watchkit extension that runs on iPhone. 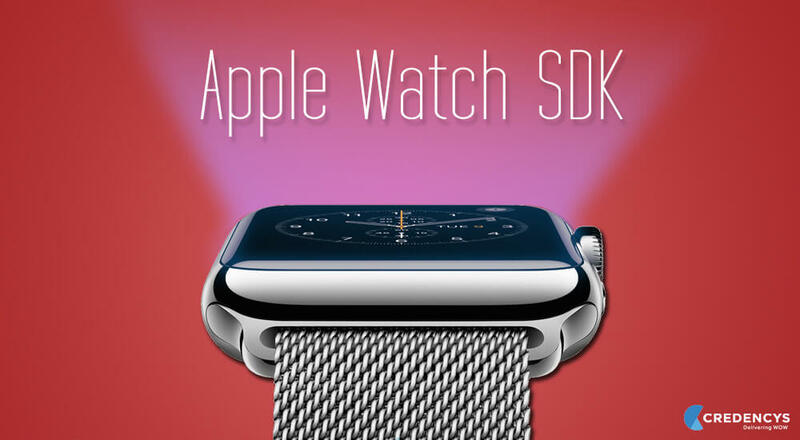 New SDK let the developers start building iWatch app ahead of its release and test the app before Apple watch hardware which debuts early next year. There are some guidelines that Apple has set for the third party apps like- A standard black background color for all apps, new font termed as ‘San Francisco,’ user interface and standardized navigation through an app. Developers can customize some of them to make it more attractive. With Apple watch app, user can easily access the alerts of iPhone right on their wrist. There are two types of Apple watch notifications- Short look and Long look. Long look notifications are actionable notifications that are more informative and customizable. Longer version allows the user to view brief content from the app and take some actions like- Comment, Favorite or Dismiss. Short look notifications are called Glances which are quick snapshots of different information that includes- an app icon, app name and brief information. Even, they can be termed as read-only notifications. Both varieties of notification should fit on a single page and by tapping Glance; user can enter into the corresponding app. Let’s take a glance at what are the opportunities Apple Watch developers have to extend and tailor the apps to Apple watch. > Developers can change the colors for titles, status, notifications and much more. They have complete freedom to use custom fonts, but it requires a little effort and text should be preferably aligned to left. > User interface can either be hierarchical to make one choice per screen or page-based to swipe horizontally. Developers cannot combine this two, but have to choose either one of them and can also add gestures like vertical or horizontal swipes to improve navigation experience through Apple watch. > Using Handoff, developers can let the Apple watch users to pick back up right where they left off in the app, when theyswitch Appl e devices. Watchkit provided many options before the developers and with optimum use of talent and knowledge, they can bring wonders before the world. The new SDK simplified the design scheme of Apple watch apps and prevent the Apple watch app development becoming too strenuous. As Apple watch is on the wrist of people at all times can act as a potential revenue generator for various industry verticals. So, search the right developer, get your watch app ready and monetize right away! Here, at Credencys, our proficient team of developers had good amount of experience and skills in building wearable apps. Our experts are all set to redefine different spaces across the globe with breathtaking Apple watch solutions.